VeryPDF PDF to RTF Converter is designed to convert read-only PDF to editable RTF files, even encrypted PDF could be converted easily. It could convert PDF to RTF with high quality, preserves graphs, tables and text layouts even curve, rectangle and hyperlinks. What's more, it is a standalone PDF to RTF converter, so, you don't need to install extra Microsoft Word and Adobe Acrobat or Reader. VeryPDF PDF to RTF is a standalone software, MS Word, Adobe Acrobat and Reader NOT required! An excellent PDF to RTF converter to exactly convert PDF to editable RTF files. Preserve tables, graphics and images from PDF. Standalone Application, no need extra Microsoft Word or Adobe Acrobat. Support to convert PDF to RTF in 500% faster speed. What are RTF (rich text format) files, and why should one use them? RTF (Rich Text Format) is a standard file format which simplifies the exchange of documents between different word processors and computer operating systems. For example, one can send an RTF file created in Microsoft Word 2002 using Windows XP to someone who uses Word 97 in Windows 98, WordPerfect 6.0 on Windows 3.1, StarOffice on a Linux system, or Word 5 on a Macintosh system and all users will be able to open and read the file regardless of the software version or operating system. The rtf format can be produced by any standard word processor. Simply go to "save as" and choose Rich Text Format from the options menu. The file you save will have a .rtf extension, e.g. filename.rtf. If one normally uses Word and saves texts in Word format with the default .doc extension, changing a saved text to .rtf will not delete the original .doc file. 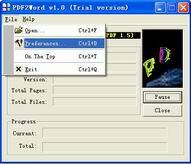 One can also select rtf as the primary mode for saving texts with one's word processor. With received rtf files, most web browsers and word processors will recognize and open the file automatically. With some word processors one may have to go to the File-Open menu and then select either "All Files" or "Rich Text Files" from the File Type menu at the bottom in order for the RTF file to be visible (if, for example, you are using Word and the default for the File Type menu is to show only DOC files). RTF may be thought of as a more sophisticated equivalent of the "plain text" (ascii text) format for universal document transmission. Plain text files were the "original way" to send and receive by any user regardless of the word processor, version, or operating system used by either the sender or receiver. However, plain text files cannot include "text markup" data such as boldface, italics, and underlining, not to mention tables and graphics. RTF enables one to include all the text markup which had been in the original Word, WordPerfect or other word processor document. An RTF file will look and print exactly like the original. It can also be easily converted by the receiver's word processor into .doc or other format for revision, and reconverted back to rtf for re-sending. There are several significant advantages to the RTF file format when one needs to send or receive files from others, either via diskette exchange, e-mail attachments or putting the file on-line in a web directory for others to retrieve. RTF files, unlike Word .doc files, cannot contain the numerous "macro" and other viruses that plague Microsoft Word documents. As a consequence of all the viruses that may be carried by Word .doc files, many business and other e-mail servers refuse to accept e-mailed "attachments" which are in .doc format. However, they will accept the same document in RTF, since the RTF file cannot transmit viruses. This security against the risk of virus infection applies regardless of whether your document would be conveyed via diskette, e-mail attachment, or as an archived web file. If your document only includes text (including text markup, but no graphics, sound files, etc.) then saving it as RTF rather than as a DOC file usually also results in a considerably smaller file size. This means that upload, download, and e-mail transmission times would be quicker, and one would have greater disk storage capacity due to the smaller file sizes of your documents. These may sometimes be considerable advantages. Conversely, if the document contains embedded graphics, audio files, etc., then an RTF version may be considerably larger than the DOC version, as RTF would have to convert highly-complex graphics information into RTF format, which would involve a considerable amount of coding instruction.